It has been an eventful past week and I only managed to steal some time to peep at some of the great valentine and non-valentine posts but had not been able to post mine up. Did not even have the time to give some thumbs up to these great post as they were merely pit stops. Haha! I will be starting a new chapter in my career very very soon and that explains why I had been MIA. The new place that I will be joining may possibly bring me closer to the origin of bento i.e. Japan!! Hmm.. come to think of it, it was also part of the deciding factor. Haha! 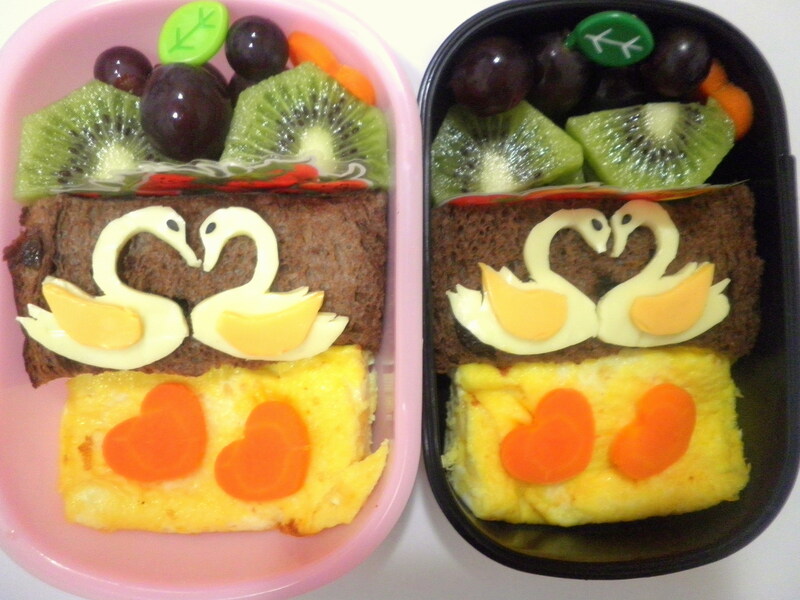 Anyway, let’s see the valentine bentos I made earlier but did not have the time to post. I seriously hate my photography skills. 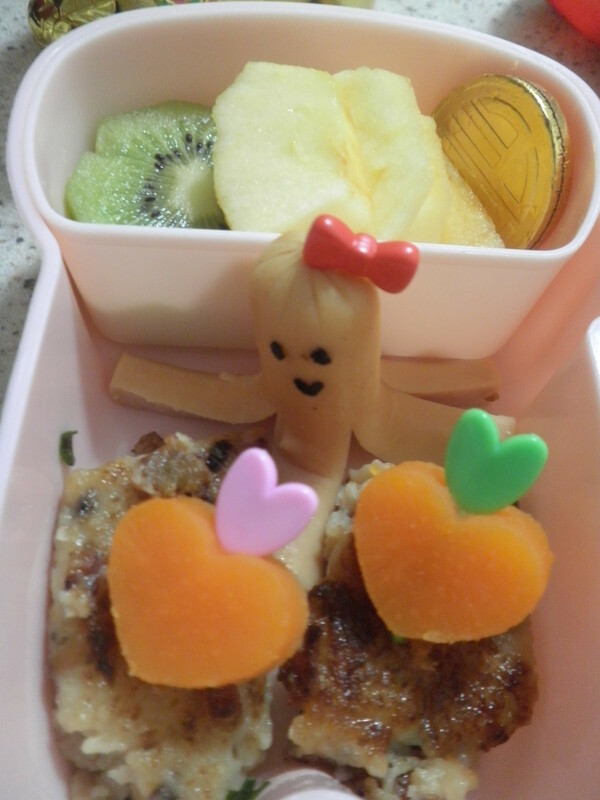 If only I stay with my little brother, I will make the bentos and get him to snap the pictures. Then I guess no matter how ugly my bentos are, his photography skills will beautify them. Haha! 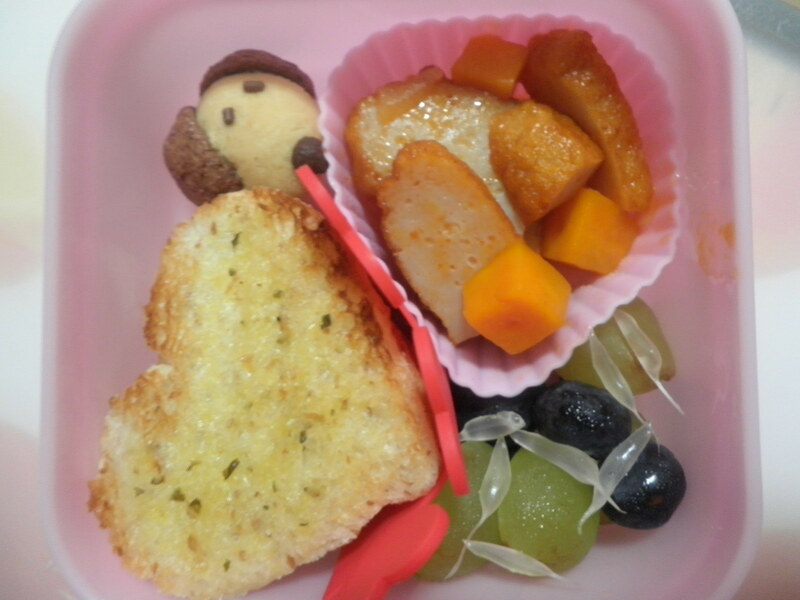 Anyway, I had great great plans for the Valentine bento. I wanted to make cupids like Lia of Bentolicious. Did some research the weekend before Valentine, printed the cupid I wanted, trace it on baking paper, started the cutting the cheese and then disaster happen. I messed up the eyes and I was getting tired so no cupid. “Booo Hoooo”. 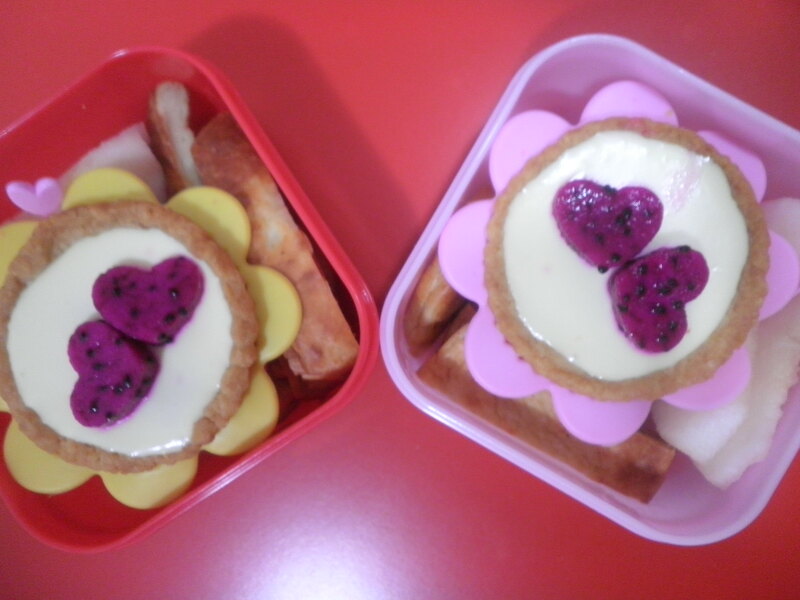 So end up my actual Valentine bentos were just two simple dragon fruit hearts on top of extremely delicious home made blueberry cheese tarts. These tarts are made my neighbour and she never fail to give me loads as I’ve oohh and ahhhh over her tarts every time. Haha! In the boxes there were also some chicken burger patties and two slices of pears. I read about all the Valentine love stories during my “Twit pit stops” and had to share mine! Hubs made the below meal for us but, truthfully, he handled all the meat and I made up the sides. 😀 We had a quiet dinner at home, and he made me Mojito to go with our meal too. Nothing fanciful but it was a pleasant evening. 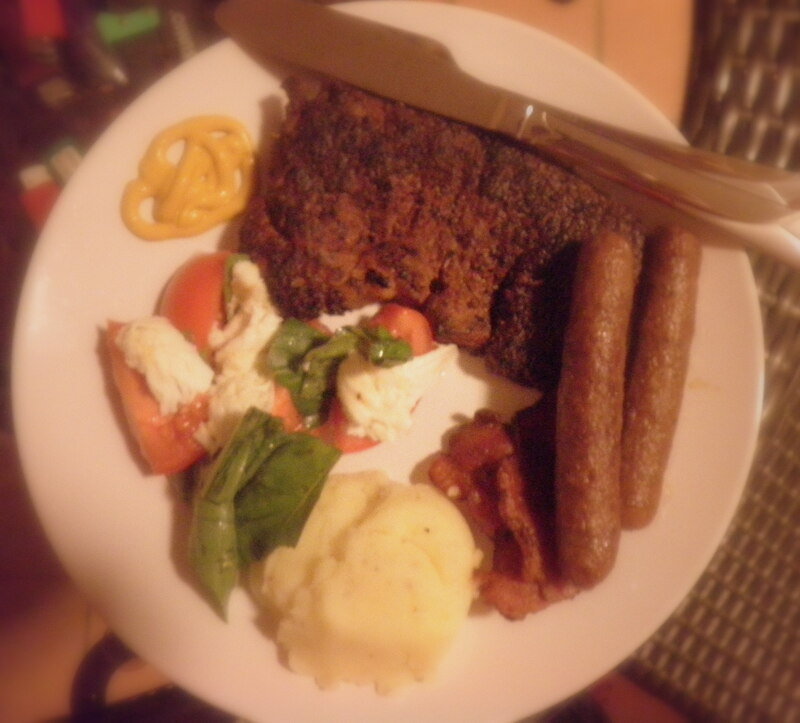 We had rib-eye steak, lamb sausages and some back bacon to satiate our love for meat. The sides were merely simple mash potato and a new salad I learned from watching Junior Masterchef programme – Heirloom Tomato Salad. I made quite a bit of variation as I didn’t have some of the ingredient and I was also pressed for time after braving a crazy traffic coming home that evening. You can get the full recipe here. 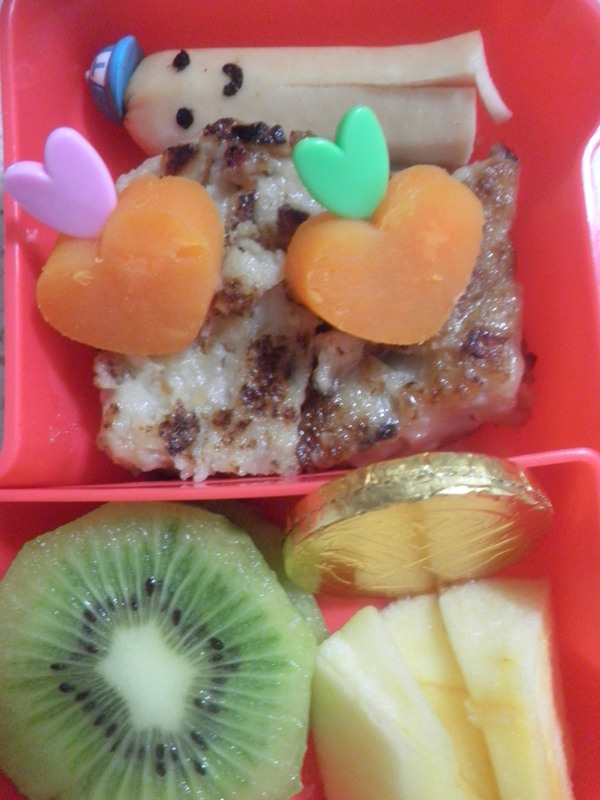 I saw many valentine bentos being put up recently and thought..”Hey, I can’t miss the lovey fun!” So here we have today, my first Valentine bento. Actually, I think my last post could be counted as Valentine too coz there were heart shaped sweet potatoes! 😀 Anyway, this bento is only a prelude to a bigger Valentine bento that I am planning for next Monday. Pray that I can pull that through. 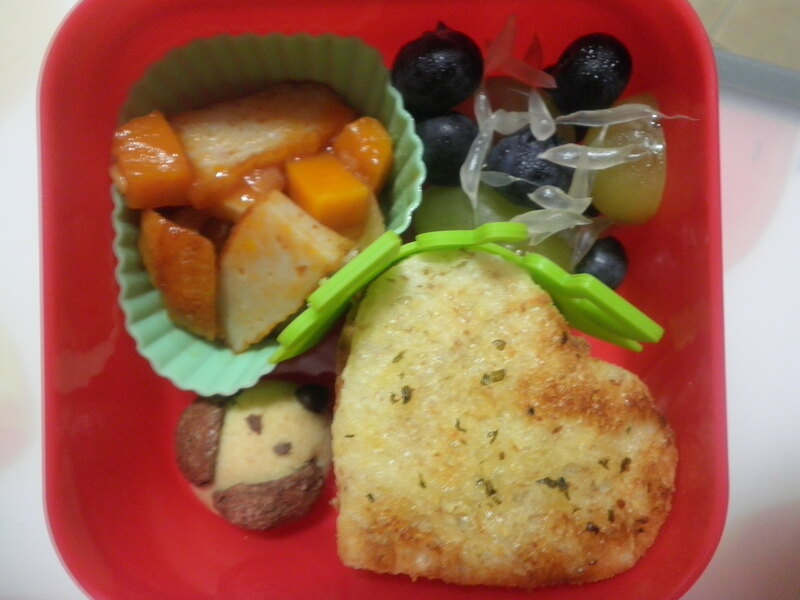 The above bentos contain heart shaped garlic toast, home made fish cake cooked with onions, pumpkin and tomato sauce, blueberries, grapes and some slivers of pomelo. Need not make anything kawaii today coz I have got this extremely cute looking puppy shaped butter cookies from a friend and two of these puppies found their way into today’s bentos. 😀 Those ears were made from Nestle’s Koko Crunch. Cool right? I am extremely terrible with my photography skills. My pictures are definitely not appetizing. Sigh..Must take a lesson or two from my lil brother. Anyway, started work after a long week of break. My little girl also had that long a break and it was both a good and bad thing altogether. Good, in the sense that we managed to spend the whole week together. Bad, is that she cried for three whole hours yesterday when she went back to school. Sigh..I’ll have to go through that “convincing her that school is a great place” phase once again.